For those watching their weight chips could be called the devils own food, but with a little care they can be part of a meal or just a tasty treat without piling on the pounds. Boil a pan of salted water and put to chips into the water for no more than three minutes once the water comes to the boil. Remove from the heat, drain and leave to cool. Meanwhile take a large non stick baking tray and to ensure that the chips definitely do not stick to the tray dab a little oil onto a piece of kitchen paper and wipe the tray all over. Next, tip the cool par boiled chips into a clean plastic bag add the oil and season well. Shake the bag carefully so that the chips remain whole but are coated in the oil and seasoning. Place the chips onto the baking tray making sure they are well spread out. Place in the top of the oven for fifteen minutes after which remove and turn the chips over. 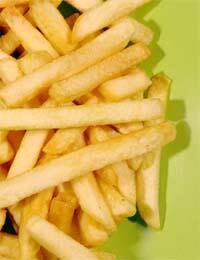 As ovens can vary turn down the temperature if you find that your chips are browning too quickly. After fifteen minutes remove from the oven and check to see if they are cooked through If not return to the oven for a little while, remembering to check them in case they burn. Serve as an accompaniment to a meal or as a snack with home-made tomato sauce or a tasty low fat dip. Prepare as above but when the chips are placed into the bag along with the seasoning add half a teaspoon of chilli powder. You can also add the seasoning once the chips are arranged on the greased baking tray, this way you can judge how much seasoning you wish to use. There are plenty of seasonings for your home made chips. Take a look at the herbs and spices on sale in your supermarket. Garlic salt, Curry, paprika, lemon pepper – the list is almost endless. For even lower fat chips purchase one of the low fat sprays that are readily available in most good supermarkets. Spray your non stick pan before placing the chipped potatoes and then spray the potatoes with the low fat spray. Remember to spray again when you turn the chips. Apply your seasonings once you have sprayed the chips. Small new potatoes are ideal for home made chips. Boil them in their skins in salted water until they are tender before following the above directions.